I’m in love with someonething I didn’t even know existed until last week. 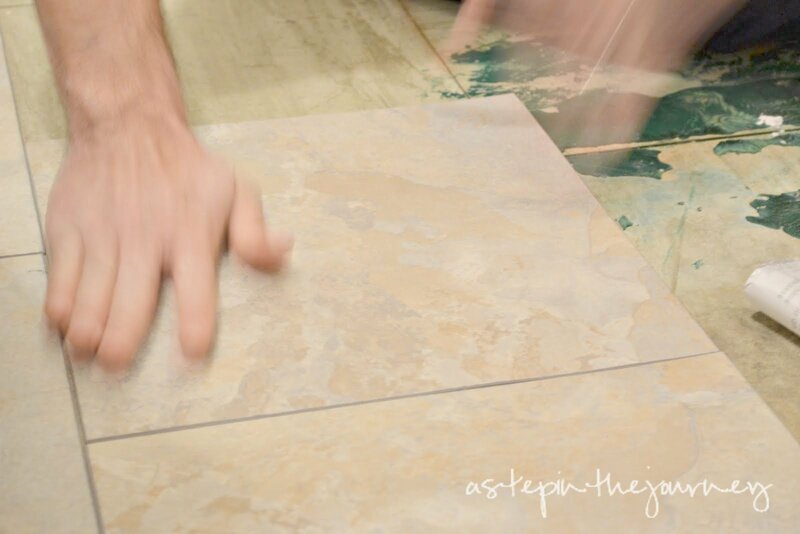 But peel and stick tile makes my heart go pitter patter. Do you feel the same way? Did you know this little gem was out there? I know to the average eye it doesn’t look like much, but let me show you what we were dealing with before. It was oogly! 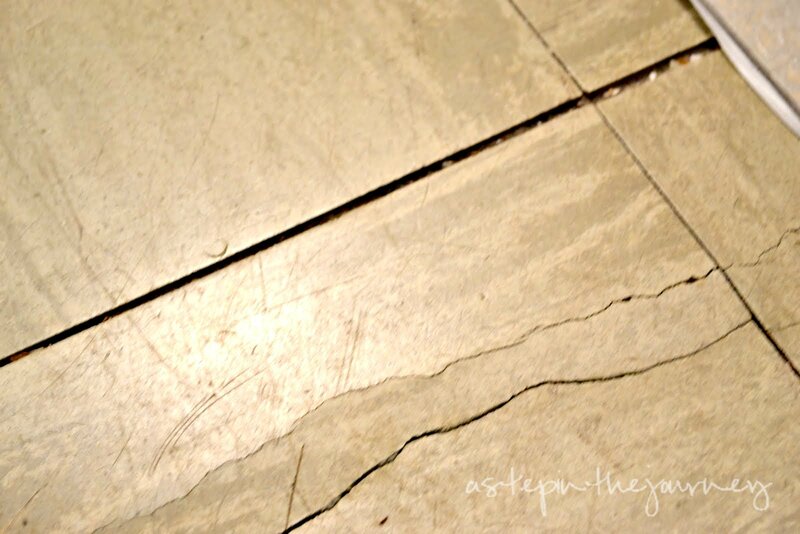 The cracks weren’t matching up, the tile color must have been called “puke,” and it was cracking in several places. I’m not sure why we waited so long. We were worried with a $100 budget we wouldn’t be able to make too much of a dent into improving this eye sore in our laundry room. That is until I found this post from ThriftyDecorChick. So me and my right hand man and I got to work. The tile came from Lowe’s and was only 88 cents for each 12 x 12 piece. Can you say…cha ching!! I bought 60 pieces (3 boxes) for our small laundry room. We didn’t really know what we were doing, but figured for $50 we couldn’t mess it up too badly. and decided with a brick laying effect (where two edges would come together in the middle of the piece below and above)…. for amateurs like us we thought that by choosing a brick style we wouldn’t have to be as concerned about the groove lines not matching up, leaving less room for error. There is a little more prepwork involved before you can start sticking. We didn’t pull up the old vinyl tile, but we did sweep up any debris that was around and pulled up a few broken pieces. We were fortunate that the floor was pretty level overall. Then we started laying the tile. Here is the BEST TIP WE LEARNED: Whenever we needed to trim a piece to fit up against the wall we used my craft paper cutter! It was amazing how well it worked, and the lines were always straight! The blade did a great job of scoring the line we needed. Then just snap! what I do know is it wasn’t appealing to the eye, and now it’s gone. So it seems III is the one doing all the work, but I was there too. And this is what two and a half hours of peeling and sticking will get you. 1. The back is really sticky. but with a little muscle and finger nails you can pull it up and readjust. 2. Masking tape works well to point out where to cut, when you are too lazy to go upstairs and get a ruler. 3. It’s more fun to do it as a team. (especially when you need someone to move the washer out of the way). If you are thinking about trying peel and stick tile yourself and have any questions, please shoot them my way!! I’d love to help! I don’t know if you can seal them or not. I would ask the floor professionals at your local hardware store or call the company. Good luck! I built my home and the contractor really sold me on this. I loved it….at first. What he didn’t do was grout it. As the house settled, the seams came apart just a hair, which was enough for water to get down under the tiles. I now have several places in my house that the floor has rotted and my home is only 8 years old. 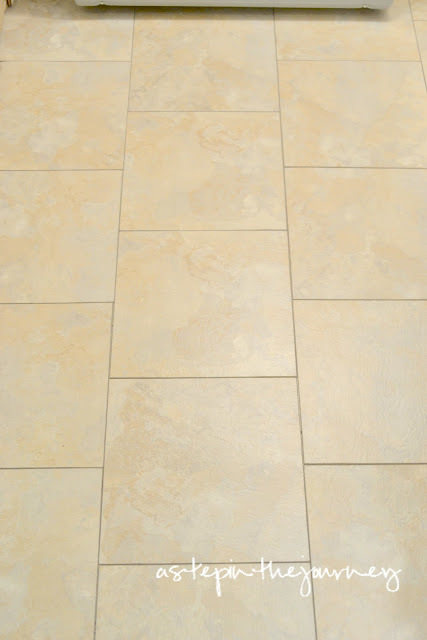 If you have a wood floor, I suggest putting down a barrier first and then grouting and SEALING the tile! Otherwise, you will be hating this years in. I promise! I will never use this product again!! Thanks for this helpful info! I was elated when I, too, found out about this nifty tile!! I have done my kitchen floor in a wood looking tile. I have now ordered enough for the rest of my condo!! I have ordered tile looking pieces for the rest of my place, not wood. You have some helpful tips! Thanks! Great tip with the cutter. When I put these down i just used a metal ruler and a box cutter. 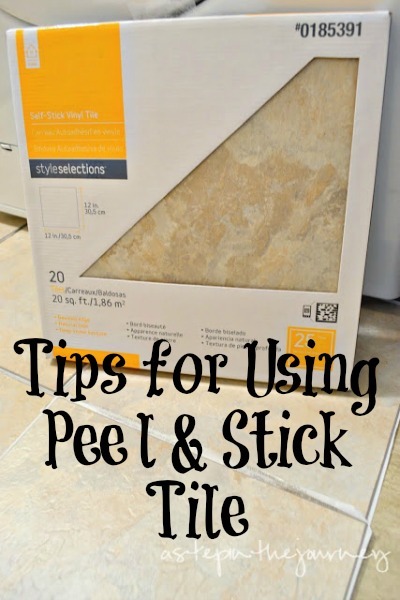 These are really great for uneven (not 100% flat) floors. Hard tiles don’t handle unevenness very well. My only concern is that they will not last so long as the hard stuff but given the budget/how cheap they are, they are a great option. My hub and I did this in our kitchen a few years ago. We took the old linoleum out and painted with floor primer. It looked pretty good for a few years but now all the edges are coming up and we will need to replace or put something else down, maybe plywood cut in wide strips to look like wide plank boards. Problem with anything, is we have cats and dogs and keeping them out of the kitchen long enough to get it done. And if we do any polyurethane, it has a strong odor and has to dry so long. Hi, Can these peel & stick tiles be applied to a hideous and incredibly dirty flat carpet (in office building). We are moving in to a new photography studio, and though they will clean the carpets, I am pretty sure they will look terrible and not meet my standards for my business. No idea if the floors are level. In this geographical area, flooring, vinyl, painting, carpeting are usually installed by untrained workers who kind of “wing it”. It’s 1290 square feet. Mostly carpet, some horribly dirty vinyl flooring too in the entryway. Tips? Thanks! Please email carolyn@cprphotography.com for any long tips. I don’t know how I would be notified if anyone replies to this. Best tips for brand, glue?Thanks! I am not sure, honestly. I think the folks at a home improvement store could give you more information. I apologize if this has been asked before or not, but how would one go about cutting to fit around a toilet? I see a lot of people commenting that they put it down in their bathrooms, but I’m nervous about cutting round curves and having it line up perfectly with my toilet. Good question! I haven’t done this, but I would use a bowl/cup etc similar in size to the hole and use a utility knife to score it over and over until you cut through. I would remove the toilet. Then cut the tile so that it fits around the drain. You don’t have to be exact because the toilet will go back over this and cover it up. It takes a little extra effort, but it’s not hard to do and it will look right. We, well my husband layed sticky tiles in our bathroom and kitchen but he glued them and used spacers like use use for real ceramic tile and he grouted them, it looks so good and it is much warmer than the cold hard tiles. How does it work on a concrete floor? Would you be able to pull it up later? Does dirt get caught in the seams? Not sure, we put our’s down over linoleum. I would love to know if it works though :) Dirt doesn’t seem to get caught in the seams. I put this on my daughter’s bathroom floor last July 2014!!! It is still in tact and looks great. It will left up easily if you want it to. No dirt in the seams…….Great stuff. I did this on concrete and it’s fine. There are directions on the back of the product you buy for the different surfaces. It will say what it recommends and doesn’t. I bought the kind you can grout and I love the look. I did my mud room (which was created in my garage. It’s not hard to install. It takes longer than you think it would. But, the biggest thing is it’s REALLY getting scratched up. I am really disappointed with how it’s holding up out there. I would not recommend in this type of area. A laundry room is probably better. No rocks/sand! BOO – what a disappoint this has been for me despite it’s prettiness. Idk if this is a stupid question. Can you put it over hard wood floor ? I’m unclear from your post if you removed the old tiles or placed your vinyl sticky tiles on top of the old floor. We posted ours on top of the old tiles! Thanks for this awesome post! 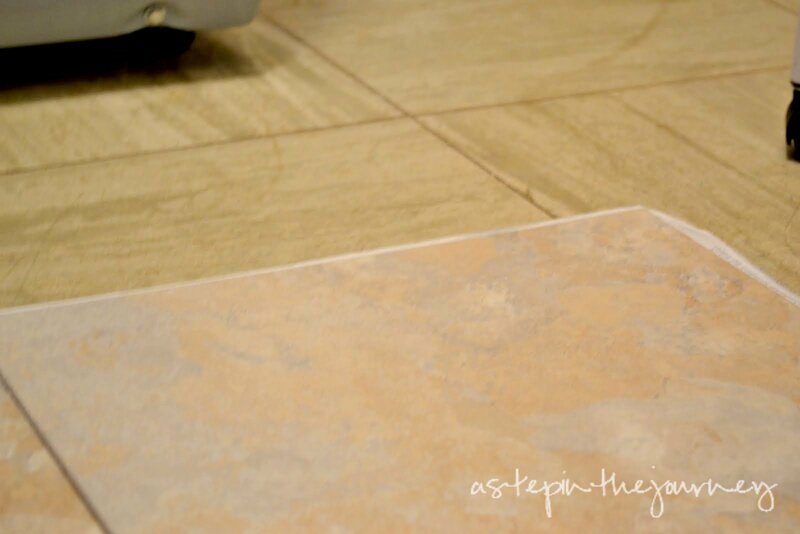 It seems like the most economical way to fix an ugly floor anywhere in the house. I do however have one concern that you might be able to answer for me; should the “grout” lines be sealed with something? I have a bad feeling little crumbs would get wedged in there and it would be impossible to clean! If so, maybe using a latex caulk would be best? 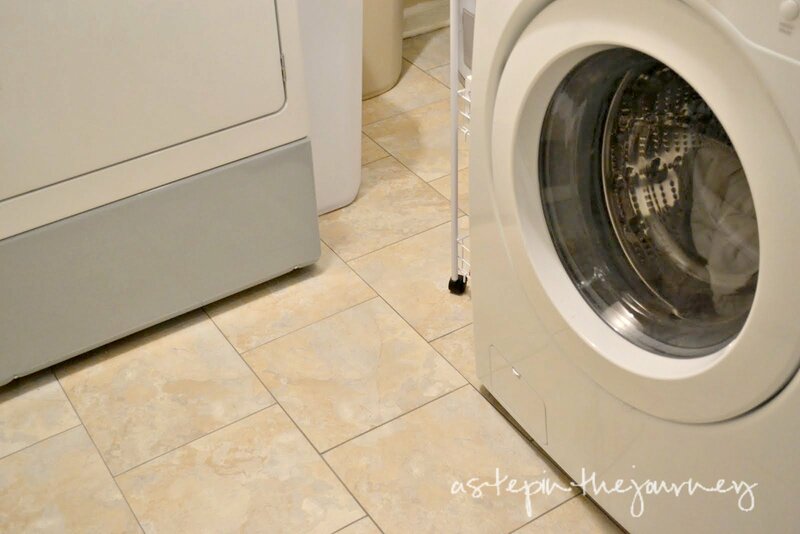 It is definitely possible crumbs may find their way into the grout lines…we used it in the laundry room so didn’t have to contend with food. Let me know what you find works best! the more money we paid for the tile pieces the better quality and appearance we got. lift when we decided to actually replace to a new tile. You can easily lay new flooring over it such as laminate or interlocking engineered wood and even lay new sticky tile over it. I personally have never had a problem with lifting or bumps and tile not lining up. I always start in the center of a room and work outward. When you get to the wall you flip it over face down and mark where the tile hits the wall and then cut and lay. If you have to match a pattern it’s like wallpaper you may have to do some small cuts to match. I don’t like starting against a wall because walls are never straight and you will see where the tile narrows. My old tile did that and it drove me nuts. I there. Thanks for the lovely idea of using stick down tiles!! I just wanted to know how it was and where you started to make the ceramic tile look? I’m thinking about using these in my mudroom and guest bathroom as a quick fix. Thanks!! Thanks so much! It was a pretty easy process. I started in the corner with the first row and then centered a tile in between the above grout line to start the second row. Does that make sense? I’m not sure! It held up really well on our laundry room floor, but I think for countertops it would just depend on how much wear they are receiving! Hi, I must say, your approach to the project was extraordinary. Most people would not have taken the extra steps that you noted for prep and then install. I am a remodeling contractor by trade and have been doing it since before most of the people on here were born. The reason I’m writing so late is I just received this in an e-mail. Yet I wanted to add to the helpful hints portion of this. I was thinking about using these sticky back tiles for a mobile home shower surround, any thoughts? Do you think this application would work being in a wet area, of a shower? I’m honestly not sure how it would hold up to lots of contact with water. I suggest talking to the folks at Home Depot or researching the tiles online before applying! would these stick on tiles work on concrete porch???? Honestly I’m not sure?? Is it flat, smooth concrete? If so, the maybe but I would check the package information or talk to someone at your local hardware store! Our home has linoleum in the kitchen and we used the peel and stick tiles to cover it and it worked great. Just be sure to clean the previous floor really well. Yours certainly turned out better then mine, last spring we decided to go the same route with peel and stick in our bathroom. While some tiles mesh together almost seamlessly, other tiles just leave this gap of well it just looks black from the dark old wood beneath it. So my question is, did you leave gaps in between your tiles? It looks like you may have, amd I think our trouble was we have an old house with some uneven floors, so now this coming spring I will tackle the floor again and hope for a better turnout. Any suggestions? We didn’t purposefully leave gaps, but I do have a friend that filled any gaps with normal grout and it looked really great! I work at Lowe’s in flooring and you can also use a vinyl grout and leave gaps then fill with grout for a more realistic tile feel. Check the back before you peel. Good tiles will have an arrow printed right on it but some of the cheaper ones have them on the paper. They need to be laid with all the arrows going the same way to line up perfectly. I’d bet if you pulled up the 2 that don’t match up. the arrows are acute angles to each other. If you have any extras, you may have to pull one more to see which wat they should go but the problem can be fixed. How does this work on stairs do you think? We have a very small space in an RV that we are thinking of doing and would include stairs. I would think it would be okay…inly concern would be where the tiles meet in tge edge of the step. It’s so inexpensive I think it’d be worth a try! Has anyone had any experience with taking these off? I’m wanting to put them down in our bathroom but we rent and although it will look 100 times better than what we have if the owners don’t like it when we decide to leave i want to know how much of a pain it might be to pull them up? They’re a nightmare to get up and leave and sticky residue. I just moved into a house which had stick on tiles down in the kitchen but half were missing. We too were on a very low budget, and as we wanted to eventually renovate the kitchen but do not yet have the funds we wanted a temporary cheap solution. We HAD to remove the old tiles because they made the floor uneven but we decided to replace them with new stick on tiles ( an even better bargain in the UK, they sell them in the pound land stores 4 for £1! Our kitchen cost around £20) anyway, we had to heat the tiles with my craft heat gun and a hairdryer before scraping them off with a wallpaper scraper, it was backbreaking and left the floor VERY sticky! It doesn’t matter to me though because when the time comes to renovate we will leave the new tiles down and tile over the top because the floor is at least level now. Probably best to just and skin your landlord their opinion first I think. Thanks for letting us know Amy! Don’t put real tile over vinyl or sticky tiles, they have too much give and your real tiles will start popping and breaking within 6 months. Its much cheaper in the long run to do it right the first time, rip everything up and level the floor with the right subfloor. Agreed. Do NOT tile over existing floor. I work in a flooring dept so I know a lot of people use these all the time because of budget issues. One thing anyone should use if they are going to do this is clean the area to be tiled and use sub-floor primer! Not wall primer, it won’t work! This preps the area for best adhesion! I’ve seen it time and time again someone coming in compaining they didn’t stick properly and are coming up. The very first question is did you clean the floor and next did you use sub-floor primer! The answer is no for anyone with issues! Another great idea is using vinyl plank flooring! It clicks together just like laminate flooring but you don’t have to worry about issues with water like laminate! They come in both tile and “wood” planks. I used the sealer recommended which is pretty much primer. My tiles are coming up. And I did this just a week ago. Oh no! Was the floor below level and smooth? What surface were you sticking them too? Did you use “sealer”???? Or “sub floor primer”????? Ok this might sound dumb or weird and you may have already addressed it, but did you start at the wall and work your way out or in the middle of the floor? We found the “straightest” wall and worked our way from there! Did you have to remove the wall trim before putting the tiles down? Thank you! We didn’t. The current flooring left a small gap when we pulled it up, so we were able to slide the peel and stick tile under the wall trim easily. 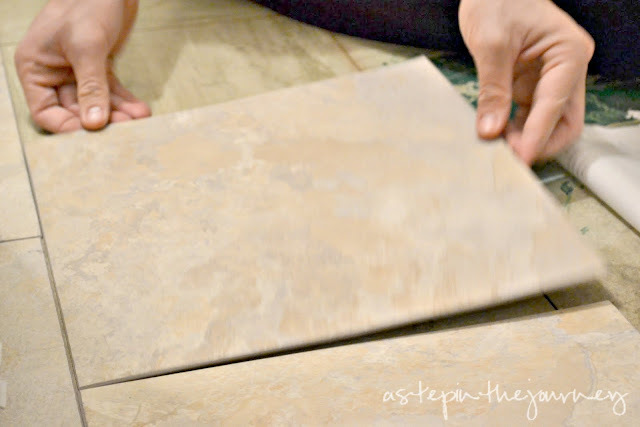 Do you think this would be a good alternative to using ceramic/porcelain tile on countertops in the kitchen? My counters are horrible, and I want to tile them, but if this would work and not look awful, I’d like to use this instead. Thoughts or comments, anyone? I used these on a counter top. But it was an area that “hot pans” and things would never be put on. Not sure how they’d hold up if you did that. But it was easy to put on, easy to trip and looks great. I actually put peel and stick tile on the ugly counters in my classroom a few years back. They still look good! This stuff is awesome! I took up the old stained linoleum in my kitchen at replaced it with a parquet style peel and stick tile. It looks just like wood tile and really brought my kitchen to life. 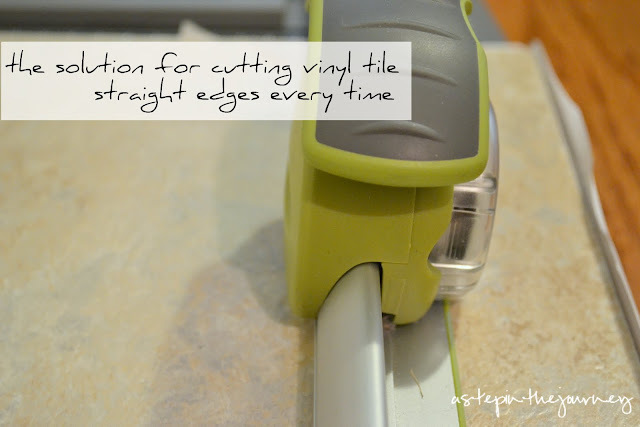 Tip for those who don’t have a paper cutter: using a metal ruler and a carpet cutter/knife (the razor blade thingies you put in the metal handles) works really well for cutting the tile too. Like with the paper cutter, all you have to do is bend it back to snap it! Great tip Tina :o) Thanks for sharing!! About 20 years ago, I had a water leak in my old mobile home. I was divorced recently and had NO extra money!! Well, my daughter’s bedroom carpeting was destroyed by the time I discovered the problem – mold/mildew, etc. I was able to take up the carpeting, dry out the “plywood” floor. Then, because of the no money thing, I purchased peel & stick tiles. It was an easy and inexpensive way to make the floor livable again. These things have been around for years. I put pell and stick tile at the back of my daughter’s desk, across from her chair insert space, so her shoes don’t mess up the paint. We used the stick on tiles that you can grout in our bathroom remodel. They are wonderful and cut like a dream. We took the 12×12 tiles and cut them into 6″ tiles and put them above the tub/shower. The didn’t want to stay on the vertical wall even with all the sticky stuff. So my hubs took his trusty nail gun to attach them to the wall. Can’t see the nails, and they are there forever. I poor pity anyone that wants to remodel later…they will be a bugger to take down. So glad I checked this out… guess what I’ll be doing this weekend!! Woohoo!!! Looks great! I’m going to try this in my bathroom! War Eagle! 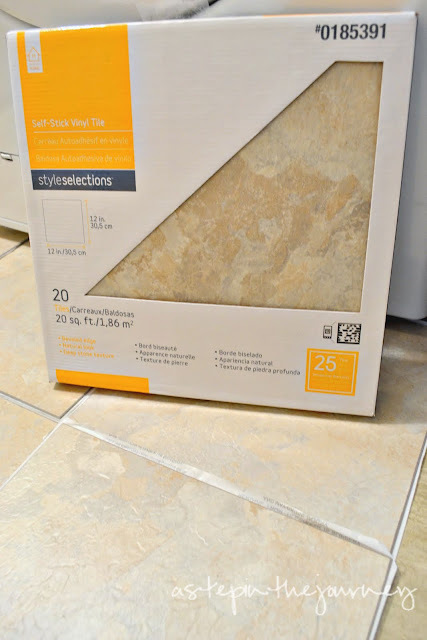 I am getting ready to cover our vinyl bathroom floor with peel & stick tiles. I used them to make a “faux” fireplace (I bought a mantel on Craigslist and used black to do the “opening”, then put candles & a grate in front – you would never know!). 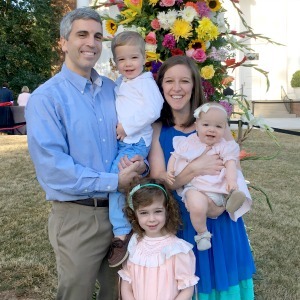 Linda had asked about using them on walls – YES, you can, but my “fireplace” is on a southern-facing wall that takes a lot of heat in warmer months, and I did find some of the tiles slipped. I reglued them and used black acrylic paint with a fine tip paintbrush to fill in so none of the beige wall behind was peeking through. Has held up great for the past 4 years. Love this post – will be copying your “brick” pattern, as I love that more than just squaring up the corners and probably getting it wrong. 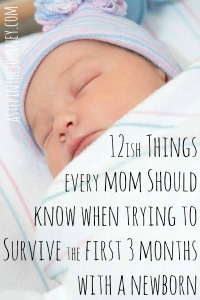 Thank you Pinterest for leading me to this post! I love ours in our kitchen. Did it in 2009 still looks fabulous. Love your new floor! I actually used these stick on tiles to make a backsplash in my kitchen. They look great and super easy to wipe down. Love your new floor! I actually used these stick on tiles to mske a backsplash in my kitchen. They look great and super eady to wipe down. So glad to hear about the backsplash! I’ve been wanting to do something with mine! Do you think it’s possible to apply them onto a wall ,? I know a few people that have used this and it has worked great! I’m in the process of updating my bathroom and will be using these “laminate tiles” along with a grout. According to my local store, you can grout just the same as you would with regular stone tiles. 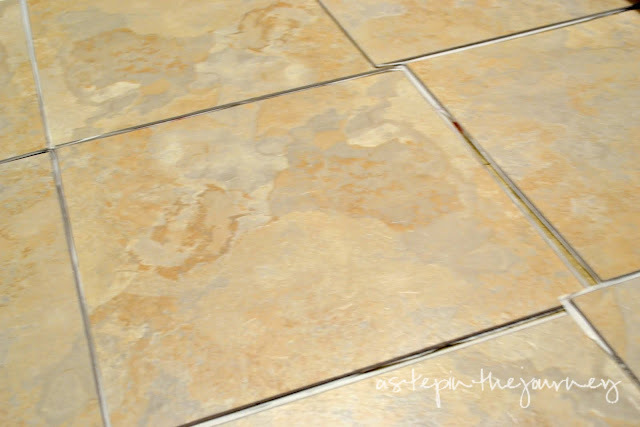 You just have to use grout that will work with the thinner gaps. It was also suggested to me to use a floor glue in conjunction with the sticky back for extra stick. oh I wish you could post pictures……I just purchased 6 new boxes of stick on vinyl planks at Goodwill and was thinking they might look good on othe wall. what a great idea! My husband and I are just now thinking about buying and place so I am SUPER interested in all of this kind of DIY cool stuff for the first time! Thank you SO much for sharing! I was just at Lowe's this week looking at the very same thing. We are going to be redoing our bathrooms. glad to know it works! Great job. Looks so much better. Never would have guessed they were peel and stick, looks like there's grout in the cracks. It really looks great, especially seeing the before, amazing how it changes the feel of the room. Got the same problem in my apartment, especially in the kitchen, with screw holes at random places, but alas, it's a rented apartment… Oh when I have my own house one day! Always good to get tips and tricks until then though ;) Thanks for sharing! Awesome!!! Come fix my kitchen floor! Came across your blog on a link party! Love your new floors! I am having such a hard time myself cutting our floor tiles too. What kind of paper cutter is that? The previous owners of our house did a peel and stick in the kitchen. Unfortunately, there are several…for lack of a better word…gouges? So it makes the floor look like it needs to be swept, but it doesn't. We're making a trip to Home Depot tonight to see if we can find matching tiles. I'm hoping we can, because only a handful of them need to be replaced. Peel and stick….why didn't we think of that? It looks great and I like it that you staggered it too. So it's in your laundry room, eh? I wonder how it would hold up against water on there. Will you let us know?